China is one of my favourite countries to visit in recent years and having been there at least five times now in the last couple of years, I have grown to embrace the modern technologies and conveniences that seem to be integral in everyone's lives. There are ways to get around the Great Firewall of China (so you can still access sites like Google and Instagram even when you are there) and honestly, there is just so much to see and do in Beijing particularly. With all that being said, I have always been extremely interested to get my WeChat Wallet set up so I can actually use it while I am actually visiting. Click HERE to check out the top activities in China! There is no official guide at the time of writing with regards to allowing foreigners to set up and utilise the WeChat Wallet (which makes your life an absolute breeze when you are visiting China). Having a balance in your WeChat Wallet enables you to make payment to merchants, businesses and essentially anyone in China via a simple but effective method - scanning the QR codes on tables in restaurants will allow you to not only view a menu but also order from it, check your bill and eventually make payment. How to Set-up WeChat Wallet? In order to set up your WeChat Wallet, you will need to have the WeChat app downloaded into your mobile device - you will obviously need to have an active account (it does not matter whether you have a China mobile number but that does help in certain aspects). Once you have an account going, you will have to activate the WeChat Wallet by adding a bank card into the application you will have to enter your card number. expiry date, name, address as well as some contact details. Once this has been successfully completed, you will be able to see a WeChat Wallet option within your application. However, you will not be able to load money into your WeChat Wallet using your credit card (assuming it is not a debit card from a bank account that you have opened in China) - your international credit card serves only as a form of identification. How to Load Money into WeChat Wallet? The only way to load money into your WeChat Wallet is to use a debit card that is issued in China. Using a debit card that has been issued by a Chinese bank based in Singapore will not work. For example, if you have opened a Bank of China account here in Singapore, your credit (or debit) card will not be accepted in terms of loading money into your WeChat Wallet. The only other option is to open a bank account in China itself (which is a challenge on its own but I hope to write a guide about this in the near future) or to get a friend to send you money via a Hong Bao (Red Packet). It goes without saying that you should probably try to find a friend who is based in China (or at least have access to a UnionPay debit card where he or she can load money into his or her WeChat Wallet first). 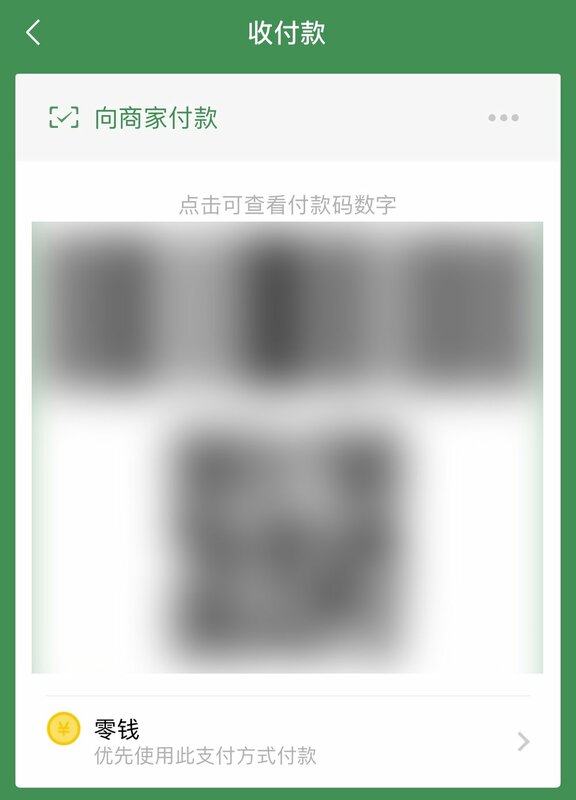 Once the money has been loaded into this person's WeChat Wallet, he or she can then send the money over to you via a Hong Bao - there are no transaction fees involved with sending or receiving a Hong Baoso this is truly the best way for a foreign visitor to get an account balance in the WeChat Wallet. If you do not have a friend who is willing to help you out, there are various reputable websites online that will recharge your WeChat Wallet for a fee - be prepared to pay an atrocious exchange rate which can be anywhere between 6-10% above the forex spot rate. How to Use Your Balance in WeChat Wallet? There are two main ways to make payment using the balance in your WeChat Wallet - you can either scan the QR code of the merchant that you are trying to make payment to, or you can allow them to scan your QR code to take payment from your account. The first method is preferred and it is probably the most common way people actually make payment. With that being said, I noticed that even though my account has been 'activated' for WeChat Wallet, payments to merchants using the first method failed throughout my Shanghai and Hangzhou visit last year. After digging a little bit into it, it appears that foreigners are not able to make direct payment to a merchant. Instead, the only way for you to use your WeChat Wallet balance is to request the merchant to scan your QR code. To put it simply, foreign users of WeChat Pay are unable to make direct payment - the amount must be taken from the merchant by scanning your QR code (so make sure you do not send a screenshot of your private QR code since that allows people to deduct money from your balance). How to Withdraw Money from WeChat Wallet? Unfortunately as a foreigner, there is no easy way to withdraw money from your WeChat Wallet - the easiest way is for you to send a Hong Bao back to your friend who have initially transferred you the money and then work out a reasonable exchange rate between the both of you. As a traveller who goes to China quite a bit each year, I am happy to leave the balance in my WeChat Wallet since it gives me some flexibility with payments (it is also quite common for you to get some kind of discount if you make payment using WeChat Pay). Will WeChat Pay become Accessible to Foreigners At Some Point? There is no clear indication as to whether or not WeChat Pay will become more accessible to international visitors in the near future but last I heard, NETS (an electronic payments provider in Singapore) was in talks with Tencent Holdings’ WeChat Pay to allow users of its NetsPay digital wallet to make mobile payments in mainland China. While a final deal has not been reached, NetsPay will become the first third-party digital wallet to link with WeChat for cross-border payments in China if successful. I have written this article based on my knowledge and experience in China but as I have mentioned at the start of the article, this is by no means an official guide and I would love to hear more from people who have had successes with WeChat Pay in China either via email on in the comment box below.